ABF & I were out this past Sunday in Long Island again, doing some Christmas shopping in some very un-Christmasy weather. Oh, it was horrible. Rainy, cold, dark at 3:30pm. Feh. I DID purchase my very first Le Creuset Dutch Oven (thanks to a birthday gift card from a good friend). I'd been saving that card for a special occasion, and 30 percent off Le Creuset was special enough for me! Where was I? Oh yes...we ventured allll the way out East to one of ABF's favorite places, Pindar Vineyards (and also the site of our second date, when I was still quite nervous and, well, quiet. Ha--that era is over!) ABF was picking up gifts for co-workers, and I was wandering around checking out the discounts. ABF asked if I wanted to go for a tasting while we were there, and of course my answer was yes! Hey, I wasn't driving! Like Duck Walk, it's 4 dollars for 5 wines. 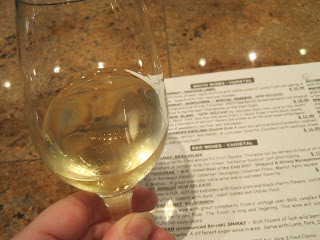 Then I moved on to their 2008 Sauvignon Blanc. I'm slowly starting to appreciate that grape more and more. These grapes grow about 100 feet from the Long Island Sound. I thought this was EXCELLENT, and ended up bringing home a bottle (12.99). Third on my list was the 2007 Johannisberg Riesling. 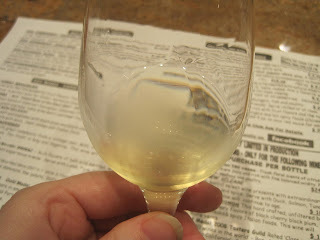 I love Rieslings, and tell everyone I know that they do NOT have to be cloyingly sweet (though I don't mind those, either!) This Riesling is the perfect balance--sweet but not too sweet. I could definitely taste a peach-like note in there. Very good! One of ABF's favorite wines there is their Merlot. 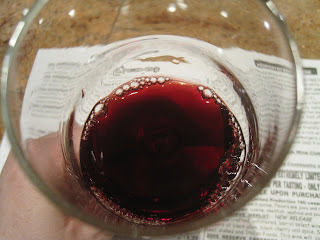 Hanging out with ABF has definitely given me a new appreciation for Merlots, which I didn't use to like as much. I'd had too many weak, watery ones. Duck Walk's still remains a favorite of mine. This one, Pindar's 2008 Merlot, is very smoky, which I'm not super crazy about when it comes to my wine. ABF loves it, but I'm still lukewarm on this one. If you're looking for a light, slightly puckery red for your next meat and/or Italian dish, try out their 2006 Cabernet Franc, which goes for 18.99. 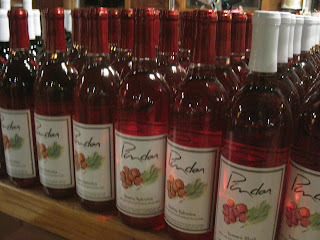 This wine, a rich ruby-colored beauty, won Pindar the Best Red Wine at the 2007 NY Food & Wine Classic. My final selection was the Cabernet Port. 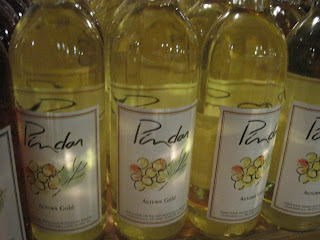 I'm a dessert wine lover (though I so rarely drink them, oddly enough), and I had to give this one a sip. It tasted very raisiny. 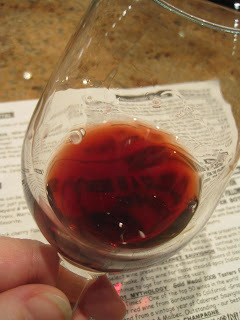 Not quite as tangy as the other ports I've had, but this was a nice, sweet, subtle port. It would make a lovely gift, and at 14.99, it won't break the bank. If you're counting, yes, you're right--that was a tally of 6 wines, not 5. 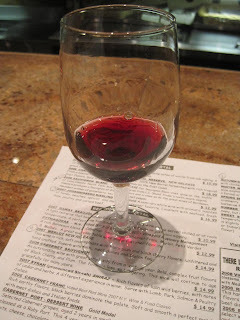 When I couldn't decide between the Cabernet Franc and the port, the server happily gave me a sample of both. Woo hoo! 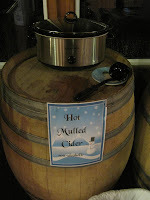 In the spirit of the holidays, Pindar also set out two crockpots bubbling with aromatic offerings: one was mulled wine, super heavy on the cloves (a little clove goes a lonnnnng way with me) and the other was non-alcoholic mulled apple cider. I actually preferred the cider. ABF and I both had some before we got back on the road. 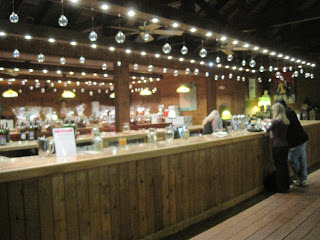 If you're looking for something to do on your next date, I highly recommend a wine tasting at your nearest vineyard! 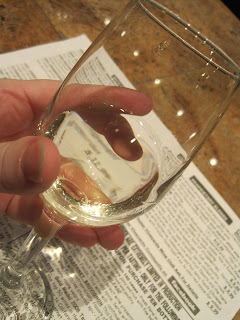 Wine tastings are a great idea, especially when you're first getting to know someone. It gives you something to talk about say, should both of you be a little quiet at first. :) You're also not going to get DRUNK, so there's no embarrassment factor. 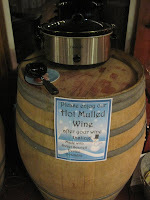 They may also inspire you to try a new wine with a new dish--or give you great gift ideas for friends and coworkers. I know ABF got some good deals for his shopping list, and I always find something delicious to bring home with me. I am open to hear your suggestions for what to pair with this Sauvignon Blanc that is now safely tucked away in my fridge!